Whisky's global popularity continues its unprecedented growth. Scotch whisky exports, for example, increased by 9% in 2017. Financial experts are predicting a compound annual growth rate between 7% and 9% through 2020. While there are many benefits to growth in an industry such as (but not limited to) innovation, and a wider distribution of a variety of products, there are some drawbacks to growth. No, this isn't another rant against the preponderance of low quality No Age Statement (NAS) whiskies crowding our shelves, or a caustic tirade against rising prices, although those are valid concerns. 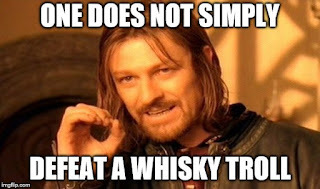 The inspiration for this post, and the reason for the Lord of the Rings exerpt above, is more commonplace, yet just as vexing: the internet troll, specifically the Whisky Troll. The Whisky Troll is almost always male. The Whisky Troll's natural habitat is the internet's various whisky-centric message boards or whisky-related Facebook pages. The Whisky Troll rejects the validity of any opinions but his own. The Whisky Troll has little capacity or desire for logical discussion; he prefers to mock or insult others. The Whisky Troll equates price with quality. If it's expensive, it must be good, and if you disagree with him, he'll assert that you're simply poor, stupid and jealous. The Whisky Troll may attempt to convince you of his authority by posting pictures of expensive bottles of whisky or sports cars and by regaling his unwitting readers with tales of his visits to scotch whisky distilleries. While these things aren't inherently wrong or condescending, the Whisky Troll uses these experiences as a basis for his expertise. E.g. "I've visited The Macallan distillery, so when I tell you their Macallan Reflexion is worth the $1600 they charge for it, you should shut up and listen." How Does One Defeat the Whisky Troll? 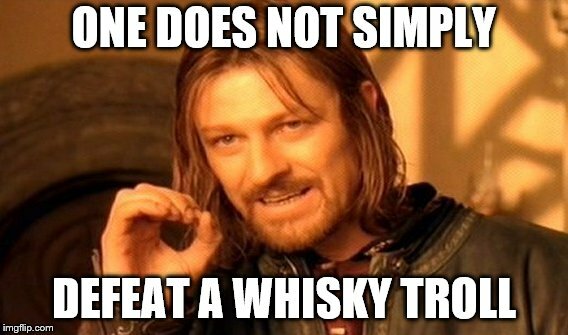 One does not simply defeat a Whisky Troll. If you engage with the Whisky Troll, you will undoubtedly suffer the same fate as Balin and the Dwarves did upon their return to Moria. I refer you once more to the citation above. The Whisky Troll wants to waste your time, insult you, and make you feel bad. If you encounter a Whisky Troll, I suggest you cease and desist all discussion with him. I've tried to reason with them too often, and I assure you it is a fruitless endeavour. What I propose instead is a Top Five list of easy-drinking, no nonsense whiskies. These whiskies are not the most complex, they are not the most expensive, nor are they the most prestigious whiskies. However they are enjoyable whiskies. 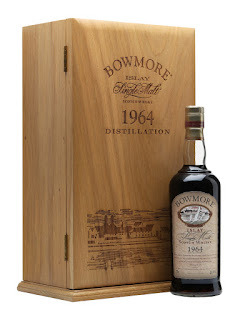 They aren't devoid of complexity, but they don't require the attention and concentration of a Brora 37 Year Old, a Springbank 30 Year Old, or a Bowmore 1964 35 Year Old. The whiskies featured on this Top 5 list are whiskies that can be enjoyed neat, on the rocks, or even in a cocktail. These are "social whiskies" or "background whiskies". Nothing infuriates a Whisky Troll more than people enjoying their whiskies the way they prefer. Ignoring their rancor is the best way to ward off Whisky Trolls. Pike Creek's 10 Year Old Canadian Whisky is finished in ex-rum barrels. It's got some brown sugar, vanilla, nutmeg, and rye notes which make it sweet and easy-drinking, but not without a little kick. Pike Creek is, for my money, a very nice "summer whisky" perfect for sipping on the rocks or with a bit of Perrier or other sparkling water. It runs about $40, so it's a no-brainer upgrade on your "standard" mixing whisky. Lot 40 is one of my favourite Canadian whiskies, but its big oak and rye flavours might be a bit too much for a whisky neophyte as a casual sipper. Pike Creek is softer, less feisty, but every bit as well put-together as its cousin (both are products of Windsor's Hiram Walker distillery). This one is a Single Malt Scotch, but one that's eminently affordable, easy to drink, and unpretentious. 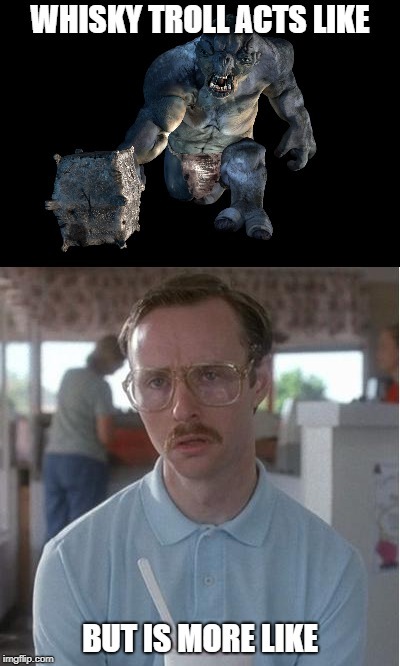 There is complexity to it, but it isn't overwhelming. It's a whisky that's great to share with friends, and it is gentle enough so as not to overpower a cocktail like a Godfather or a Rusty Nail. It's also quite refreshing in a highball cocktail with club soda. Yes, an American whisky that forgoes the letter "e". Shocking, I know. This a powerful weapon in the battle against the Whisky Troll. Dickel is inexpensive, widely available, and made mostly of corn (the mashbill is approximately 84% corn, the remainder being evenly divided between rye and malted barley). Dickel No.12 is also bottled at 90 Proof (45% ABV) so it has a bit more kick than that other well-known Tennessee Sour Mash Whiskey, but don't let that fool you. Dickel is very approachable, with lots of vanilla, toffee, and maple flavours. Dickel is one of the best values in whisky and it often flies under the radar. Another Canadian whisky? Absolutely. Whisky Trolls often try to bait ordinary, open-minded whisky lovers by denigrating Canadian whisky. Don't let them fool you or dissuade you. If you ignore Canadian whisky (or any whisky based on second-hand information) you're missing out. Forty Creek's Copper Pot Reserve is one of the most consistent whiskies on the market. It's rich, sweet, and has just enough spice to make keep it interesting. There's lots of caramel, orange peels, apricots, some nuttiness, and a touch of rye spice and ginger. It's even bottled at 43% ABV which is a nice touch. This allows the richness and spice to shine through. Oh, and did I mention it's only about 30 bucks? Get after it then. 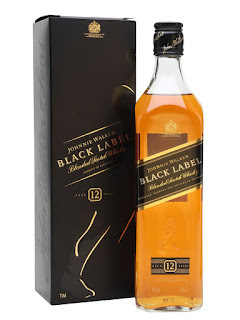 Johnnie Walker Black Label is a blended whisky. Whisky Hipsters tend to frown upon blends, unless they're expensive and/or from smaller companies. Johnnie Walker Black Label is produced by a huge mega-corporation. Johnnie Walker is owned by spirits giant Diageo, which makes it inherently repugnant to Hipsters. Johnnie Walker Black Label is popular. Whisky Hipsters turn up their beards at anything that isn't local, organic, free-range and distilled in a home-made copper pot still from barley the distillery grew themselves. 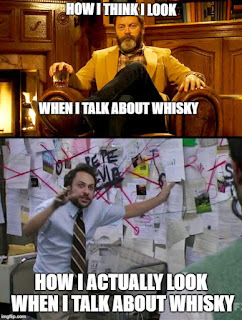 Whisky Hipsters also hate anything that literally any other person has heard of. Don't fall for it. 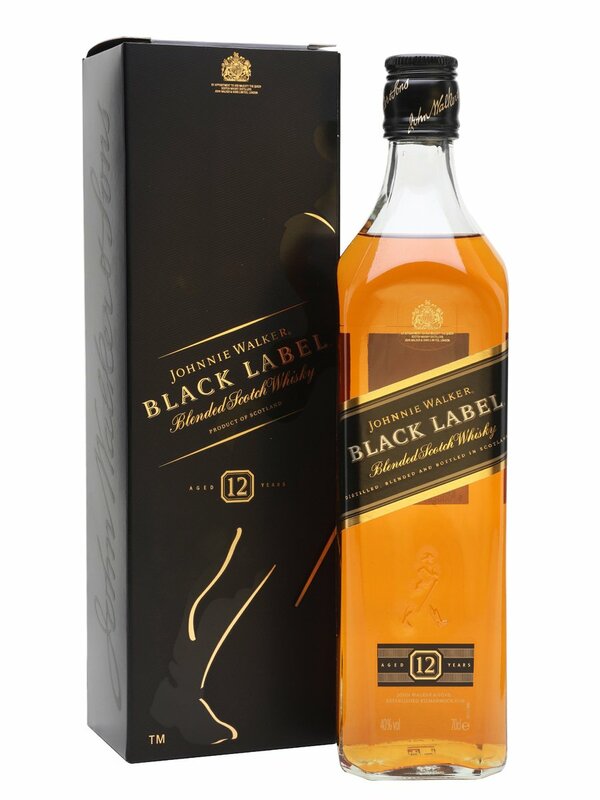 Johnnie Walker Black Label is affordable, accessible and incredibly versatile. You probably won't find it featured at a Companions of the Quaich tasting, but it's a great social whisky. Figure it out. Whisky is first and foremost about enjoyment. Your opinion of whisky is valid, even if you don't nose intensely or perceive notes of French lavender blooming in the July sun near Mont-Ventoux, or taste a faint whisper of Versos 1891 Amontillado Sherry in your whisky's flavour profile. Don't let Whisky Trolls intimidate you or make you feel sheepish about enjoying something inexpensive or commonplace. Don't forget that whisky was once the province of illicit home-distillers and smugglers (some of whom were probably my ancestors). Cognac and brandy were the spirits of choice for the upper class. Whisky should be unpretentious. Ignore the trolls, and drink what you like. It's all that really matters. When life hands you lemons, make whisky sours.